Ticon are some of the most respected psychedelic progressive trance artists. 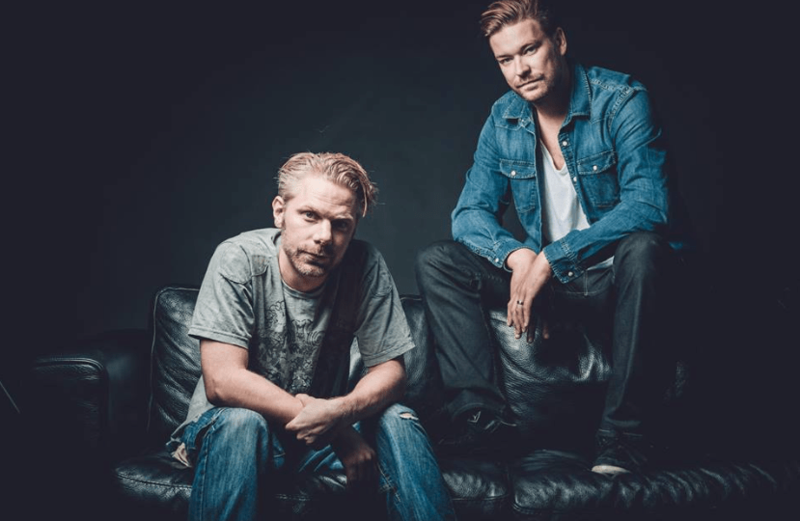 The two producers from Sweden, Filip Mardberg and Fredrik Gilenholt, formed the duo Ticon in 1998. Guided by their addiction to producing trance and their focus on expressing their feelings though music, Ticon released six albums. The studio album „Mirage“ (Iboga Records) got released in 2016. In this interview, Ticon reveals, how they discovered electronic and experimental sounds while going to underground warehouse raves to dance in front of a pair of speakers. The artists speak about the scariest situations and most funny moments in the career of Ticon – and how Ticon wants to unite people in progressive trance music. What influenced you to get into your field? Ticon: Both Me (Filip) and Fredrik were drawn to electronic and experimental music at quite a young age. Back in the 90’s, we went to underground warehouse raves and danced in front of a pair of speakers almost every weekend. The decision to start making music and expressing our emotions thru music came natural for us. As an artist, what role do you think you play in society? Ticon: I believe that every composer, artist, producer, writer (and everybody else in this world for that matter) has an obligation towards other beings. When we create in the studio or on stage, we aim to get people into trance, together as one. Music has been the driving power of unity for mankind for many thousands of years and this is still our goal… To bring people, nature, sound, emotions, senses together as one. The fact, that we on earth defy borders and nations, ethnicity, language, politics to come together and dance as one is why we still are working so hard with what we do! Creating on a regular basis can be a bloody tough job, so what motivates you to press yourself into the workstation every single day? Ticon: We don’t sit in the studio every day. The process of inspiration is a tricky one…. We can spend a whole day just wander around, discuss ideas and when we really feel motivated to go into the studio, we do it with full force. Ever since we started making music 20 years ago, we have been chasing the feeling and emotion of a song. This is, what drives us to create new approaches to trance music and how to improve both technically, but also to challenge ourselves. Out of all the hits we have had with Ticon, it has always been the ones that we thought nobody would like. As a musician and producer it is really important to believe, that change and different approaches are a good thing. Ticon: Always terrified and bit shaky, but its a good thing. It keeps us alert. But in the second, we go on stage, the nervousness transforms into energy. Until today, Ticon is immensely addicted to creating music. After releases of six albums, Ticon still always searches for new ideas. The source of inspiration for the projects of Ticon: A pair of speakers on a field and a small studio in the Swedish forest. Ticon tries not to get to carried away with techniques and tricks. What’s the story behind your artist name and project? Ticon: We have had many different names through the years, but the first name that we could put on a record was Tripticon back in the 90’s. We were making some really hard goa trance music back then. We live in Malmö in Sweden. And Son Kite was just starting up their new label Digital Structures in 2000 and were looking for new talents. They gave us a dat tape with some music they liked and asked, if we could try and make something like it (the music on the tape was Massimo Viviona, Der Dritte Raum and such). We made a track and they signed us immediately. Then we had to make a new name for this project of corse and we used our old Tripticon and remove the “trip” and left was Ticon. Our side project Chritical Choice (Ticon & Dj Emok) was a quite easy name to choose. It was a critical choice to put us 3 crazy ppl together! Has the process of making music transformed you? In what way? Ticon: Absolutely. Music takes up almost every second of our lives and we are in some ways “damaged” by it. Not in a negative way, but we always think of new opportunities to create new music in every situation we’re in. What is your muse? What inspires you? Tell us about your favourite piece of music, and the source that inspired it. Ticon: Still, to stand in front of a pair of good speakers on a field. That is our muse and has been so from the beginning. When we create in the studio, we try to keep that in mind, “would this work when you have been sleeping in a tent for 3 nights (or not slept at all for that matter)? As studio musicans, we think, it is really important not to get to carried away with techniques and tricks. In the field (the dance floor), it’s the main idea and the feeling of the music that matters, not how great you are as an engineer of building the best break buildup in the world. We put this idea to the test just recently as we went out to the Swedish forest with our side project Critical Choice and dear friend DJ Emok from Iboga Records. We set up a primitive studio in a small house outlooking the forest and just made what came out of our hearts, unpolished and ruff. The result differed a lot from what usually is being created in the city, with its stress and “values of how good music should sound like”. The result was great and we will do this agin for sure! What’s your biggest temptation or vice, what can you not resist? Ticon: Our studio, whatever happens in the future, we will both have to be able to make music there. It’s like going to the gym, we are both addicts to the creative process of making music. It is the feeling of creating something new for the first time that has us in its grip. Also beers, we love beer, that is a fact. When stuck in a creative process, Ticon sometimes involves other talented artists to get inspiration. But Ticon also experienced funny and scary situations, where no other person was able to help anymore. Being afraid of flying in a small plane in Brasil and sleepwalking in underwear in a fancy hotel in London were some of the experiences of Ticon. What quality do you admire the most in others? What quality do you like about yourself the most? Ticon: I always get inspired of not just how people can be as persons, but the level of diversity and expertise some talents have. The way, me and Fredrik look at things, is probably not the same at all as others view things. Sometimes, when we are stuck in a loop of music, we send it to another talent and 1 hour later we get something back and we are just amazed, how many talented, open-minded and most of all creative artists there are out there. I am myself a bit of a self critic. I’m often not 100% happy with the creations, I make in the studio and I definitely have to work on that. But if I would name one thing, that we take proud in the facts, that we make whatever we feel like in the studio. We make whatever falls into our minds and we follow our own path. I think every musician and artist has to think like that to survive and evolve. Which phase was the hardest/scariest in your life? Ticon: If we are talking scary like in death frightening situations, I have to pick the time when we were about to fly in a small private jet plane in Brasil. The small plane was full (6 seats) and the pilot suggested a stand for the entire flight. I’m also scared of flying. I told the pilot, that I was not happy about this and that I have bait of fear of flying and the pilot turned around and reassured me, that flying a small plane like this was not at all so dangerous as flying a big plane. I asked why and he said: “When we crash in a small plane like this, not so many people die as if a big plane crash.” I got off the jet. Any embarrassing/funny moments? Yes, you’d hate to disclose your secrets, but we’d love to hear. In 2016, Ticon released their sixth studio album „Mirage“ (Iboga Records). The artists started to make a living of music right after school. The roots of Ticon lie in trance music, to which Ticon stays true to even a few decades later. The producers feel the music, not necessarily their own age – being open to the spiritual side of life. Everyone starts somewhere, what was your first job before you got into music? Ticon: As mentioned before, Fredrik worked in a music store and I, Filip, actually started living of music right after school at 18 years old. Life was scars and the rent barely played by the few gigs we had, but we could focus 100&% on the music. Flash-forward in time. You are now really old. What would you tell your children/loved ones? Into the time machine again. What do you miss about being a kid? Ticon: We are still kids in our minds, I guess. We don’t really reflect on age, age is in your mind. How do you connect to the spiritual side of yourself? Ticon: Thru music basically. Music can take you to a mother plain of consciousness. We have always been intreaged with the spiritual side of life, particular the feeling of letting go and follow the story of the music and where it takes you. Any new releases in the future? Ticon: We’ve just released our sixth full length album “Mirage”, in which we are going pretty much back to our roots on this one and explore a deeper and driving side of Ticon trance music. We also have an album out with our side project Critical Choice, where we explore the old-school “scandotrance”, which is quite known from Sweden . Nowadays, music is easily accessible via online music stores like beatport. But Ticon still likes to remember the times, when they were listening to newly arrived vinyls in music stores. Either digital or local music market, Ticon calls for supporting the artists instead of becoming a pirate. Success for Ticon is to be in peace with the world. Piracy, works out negatively for the artist, but it allows listeners’ to access music that would otherwise be hard to source. Art should be shared…in this light what are your thoughts on piracy vs. a price tag? Ticon: I think, that if you really enjoy music from an artist, you should buy it to support that artist. Almost all music today is reachable via online music stores like beatport and iTunes in all over the world. We kind of miss the days, when we released our music on vinyl and other physical ways. To hold a piece of music in your hand is miles away from a file in your computer i phone, that is actually not real, its made up by code ones and zeros. As a kid, I always stood in the local music shop and listened to the newly arrived vinyls. It was definitely a different feeling, if you compare it to today’s market on the internet with digital shops. That’s why piracy is more excessive and accepted today, I think. If you put a “face” on a release on vinyl or CD, then at least myself would be more happy to buy it. At the end of the ride, everyone’s looking for some form of success (tangible or not), what does success mean to you? Ticon: There are of course different sides of “success”. Success for us is to be at peace with our selves and the world around us. To have friends and family close to us is a big success for us. We are almost done. Give us a nutshell of the life philosophy/motto/mantra that you clutch close to your heart. Ticon: Believe in yourself. Believe in your loved ones. Believe in music and humanity. One word to describe yourself, and one word to describe music.